Homeschool Rescue . . . My Review | My Journeys Through Life . . . Herding Cats In New Mexico! 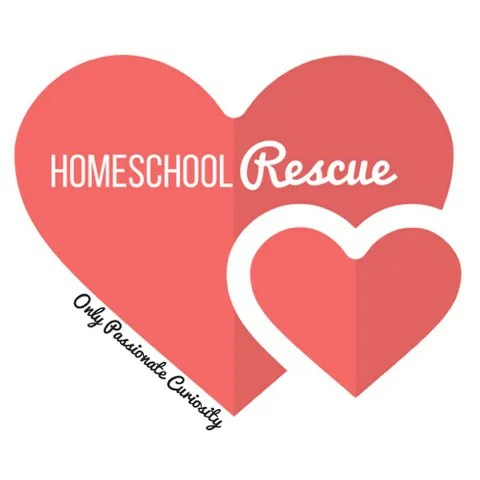 I am SO excited to have been chosen as one of 100 reviewers to try out the Homeschool Rescue course, from Only Passionate Curiosity which was created for Homeschool moms like you and me! Homeschool Rescue is an online video course which was created by Heather Aliano, a home-school mom like us. No matter where you are in your homeschooling journey, I believe that this course can be of help to you. 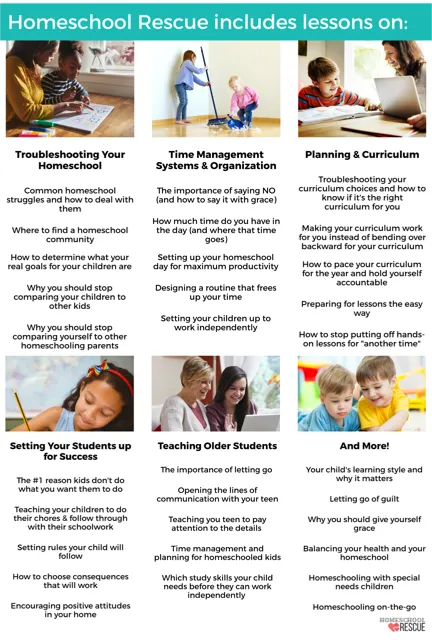 No matter what style of homeschooling your family uses, I think this can help you. After all, there is no one right way to home-school, which is the beauty of being able to do this form of education! 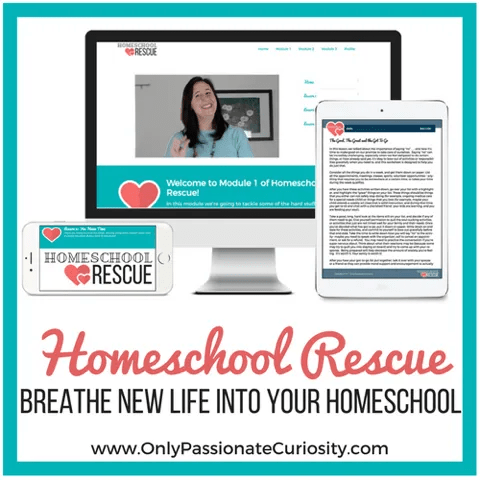 Homeschool Rescue gives you a 60 day e-Course chock full of good, practical lessons to help you get your home education on track for YOUR family. Your home education will (and should!) look like it is uniquely set up for your family, as opposed to a carbon copy of all other homeschoolers. After all, that IS one of the reasons we took our kids out of institutional schooling, yes? Along with the video lessons, you will receive audio lessons in case you like to listen on the go, and printable transcriptions in case you’d rather read your lessons. There are printable workbook assignments for each video (don’t get too upset, it’s not difficult homework at all). There will be ongoing support from other homeschool parents, resources for successful homeschooling, and bonus content which is added to regularly. Now understand, this is for lifetime access! So anytime you feel a need for a refresh, you can go right back to it! Also, in addition to the online lessons, your membership allows you into a private Facebook group, where you are able to discuss with other homeschool moms who are doing this very same e-Class! There are also a goodly number of planners you may choose from, or even mix and match to create the perfect planner for you. One of the sections which absolutely appeals to me is where the course speaks to why we should stop comparing our kids to other kids, and also, why we should stop comparing ourselves to other homeschool parents. This course is helpful in that I am learning more about the importance of self-care (to me, it’s like putting the oxygen on yourself before putting it on your kid when it drops down in the airplane). You can’t take care of others if you never take care of yourself. I also have to work harder on being able to say “no” without feeling such guilt for doing so. Both of these are so hard for me! There is an area on homeschooling with special needs children as well, which is important to me in particular. Heather appears to have really put her years of homeschooling to good use in creating this class! I can learn better time management and organization, how to find out your child’s/children’s’ learning styles and making that work better for them, and yourself. Would you like to know more about what we reviewers are learning? Check out this graphic below! 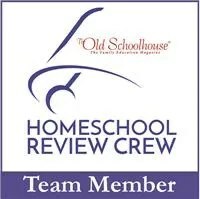 99 other Review Crew Members have also been working through Homeschool Rescue from Only Passionate Curiosity. Please, click on the banner below to see how they feel about this program!